Marking time has long been a human obsession - from the first rudimentary cave markings to wall planners, desk diaries and computerized charts, calendars have always been with us. Now scientists at the Smithsonian Institution have rediscovered what may be the first calendar created in space. An ambitious project is underway to map a 3D model of the Apollo 11 Command Module Columbia, the only surviving part of the first manned mission to land on the Moon. Few people have seen inside the capsule since Nasa transferred it to the National Air and Space Museum, Washington, in 1970. But following extensive digital scans and high resolution photography, a number of markings have come to light, including a calendar drawn onto the walls. "It's a bit of a puzzle," says curator Allan Needell. The calendar consists of a rectangle divided into boxes identified by the first letters of the days of the week. It begins on 16 July - the launch date of the 1969 mission - and ends on 24 July when the crew returned to Earth and landed in the Pacific Ocean. It could only have been drawn by one of the three astronauts - Neil Armstrong, Buzz Aldrin or Michael Collins. All the boxes, except for 24 July, are crossed out, says Needell, as if somebody was literally counting the days. "When you think about it, they didn't have a sunset or sunlight. They had a clock which showed what's called Mission Elapsed Time. But once it gets past the first 24 hours it doesn't translate very well." He believes the calendar was probably created by Michael Collins, who stayed in the Command Module while the other two landed on the Moon. "He would have been the loneliest man in the universe because whenever he passed behind the Moon he couldn't talk to anyone else. There was no radio contact or anything. One of the things he may have done in that time was written the calendar on the wall. "It's protected with plastic sheeting and taped over with duct tape. My imagination tells me that when Mission Elapsed Time showed another day had gone by, he pulled up the corner of the duct tape, crossed off another day and pulled it back down." 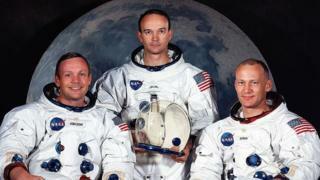 Neil Armstrong died in 2012, but Needell contacted Aldrin and Collins to ask them about the calendar. He says neither had any firm recollection of it, but Aldrin said it was most likely drawn by Collins. Other wall markings include a warning, "smelly waste," written under a closed locker, and there are various sets of numbers. "As they were going around the Moon they would have to have specific instructions for when to fire the rockets, for how long and what thrust. All those instructions were being transmitted to them and it was essential they got them right. They wrote some of those numbers on the walls and the control panels." The astronauts' movements would have been restricted by cumbersome suits and weightlessness, and although they had notepads, Needell says it was probably easier to simply scribble instructions on the walls. He is now examining voice recordings and NASA logs to piece together the exact time the markings would have been made. The Columbia Command Module was the astronauts' living quarters but never actually landed on the moon. The Service Module contained the propulsion system and the Lunar Module, nicknamed Eagle, was the craft used by Armstrong and Aldrin to reach the moon's surface. "These markings bring to life this static object that in some ways is just symbolic of going to the moon. It reveals physical details that enrich the written details, video and audio recordings we have. It adds another layer to the story," says Needell. He hopes that the new images and digital information will spark public interest and generate additional information about Apollo 11, one of the most important milestones in space exploration.